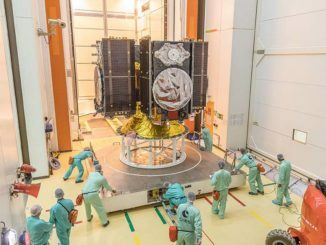 Europe’s solid-fueled Vega booster vaulted away from a launch pad in the South American jungle late Thursday and deftly delivered five sharp-eyed Earth observation satellites into two different orbits for the Peruvian government and a Google-owned mapping company. The satellites will help Peruvian authorities control the nation’s borders and combat drug trafficking, and refresh imagery of cities and landscapes for Google Maps. 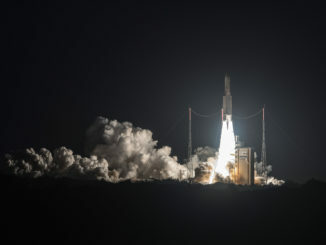 The PeruSat 1 and four SkySat spacecraft started their journey with a flash as the Vega’s first stage P80 solid-fueled rocket motor ignited right on time at 0143:35 GMT Friday (9:43:35 p.m. EDT; 10:43:35 p.m. French Guiana time) Thursday. The rocket’s exhaust nozzle swiveled to steer the 98-foot-tall (30-meter) booster to the north from the Guiana Space Center, a sprawling facility managed by the French space agency — CNES — at the edge of the Amazon rainforest. Within a half-minute, the launcher surpassed the speed of sound, and the Italian-built P80 first stage booster gave way to second and third stage solid rocket motors firing in quick succession. Verbal callouts from the launch control center indicated everything went normally. The Vega rocket’s Ukrainian-made RD-843 upper stage engine then took control of the flight, firing two times to guide the launcher into the precise polar orbit desired by the four 242-pound (110-kilogram) SkySat aerial imaging platforms owned by Terra Bella, a subsidiary of Google headquartered in Mountain View, California. Terra Bella’s satellites — SkySat 4, 5, 6 and 7 — separated from the Vega rocket’s upper stage over a ground station in South Korea about 40 minutes after liftoff in an orbit about 310 miles (500 kilometers) above Earth. The next step in the carefully-choreographed flight sequence was the release of a cover to expose the PeruSat 1 satellite, which rode in the lower position inside the Vega rocket’s Vespa dual-payload adapter system. Two more RD-843 engine firings were designed to raised the rocket’s altitude to about 419 miles (675 kilometers) and slightly change the orbit’s angle to the equator. Those burns occurred according to plan, launch controllers reported. 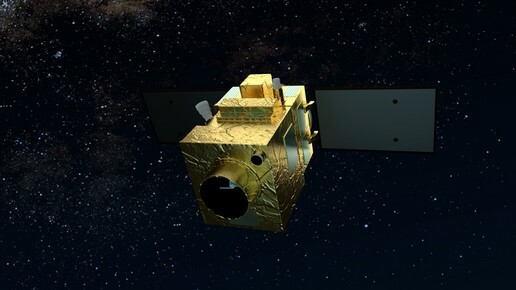 The PeruSat 1 reconnaissance satellite, built by Airbus Defense and Space for the government of Peru, deployed as scheduled at 0326 GMT (11:26 p.m. EDT). Confirmation of that event triggered handshakes and applause in the Jupiter launch control center in French Guiana, a few miles away from the Vega launch complex. Stephane Israel, Arianespace’s chairman and CEO, declared the launch a success in remarks a few minutes later. 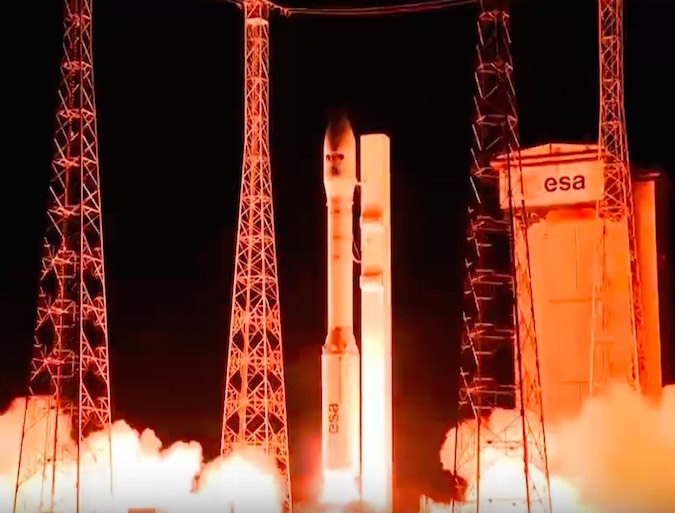 The Vega launcher, developed by the European Space Agency and primarily manufactured in Italy, is now seven-for-seven since its debut flight in February 2012. The Vega rocket can loft up to 3,300 pounds (1,500 kilograms) into polar orbit. It joins the medium-sized Soyuz and heavy-lift Ariane launchers in Arianespace’s rocket fleet. The Vega rocket’s prime contractors, Avio and ELV of Italy, are working on an upgraded version called the Vega C for a maiden flight in 2019. Thursday night’s launch expanded a growing satellite fleet operated by Google’s Terra Bella company, giving the Silicon Valley firm seven spacecraft fitted with high-resolution cameras that can take rapid-fire pictures many times a second, allowing processors on the ground to string together video clips. Terra Bella has informally named the satellites deployed Thursday after Star Wars characters: R2D2, Luke, C3PO and Leia. Formerly called Skybox Imaging, Terra Bella has its roots in an idea proposed by four Stanford University graduates in 2009. 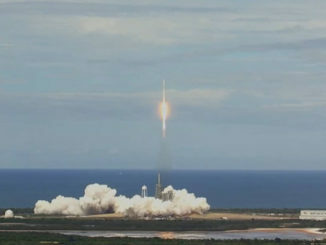 The first SkySat spacecraft launched in 2013, followed by two more in 2014 and June 2016. The Terra Bella satellites add to Google’s vast imagery catalog, which help improve popular applications such as Google Maps, according to Luc Vincent, director of GEO imagery at Google. Each SkySat platform is about the size of a dorm room refrigerator and can capture imagery of objects smaller than 3 feet — about 90 centimeters — and record high-resolution video, a unique capability in the commercial Earth observation market. Larger satellites, such as DigitalGlobe’s WorldView 4 craft launching from California on Friday, have cameras with sharper viewing capabilities, but Terra Bella’s distinction comes from the relatively low cost and wide coverage of its fleet of compact orbiting observatories. “We have the largest commercial coordinated constellation of high-resolution satellites,” Vincent said. “This will enable us to have unprecedented capability to revisit places on a daily basis. So places that matter, we can hopefully take pictures of them daily with this constellation, and hopefully even more often once we have more satellites. “This will allow us to search for patterns of change in the physical world to help address global economic, environmental and humanitarian challenges,” Paul Day said. 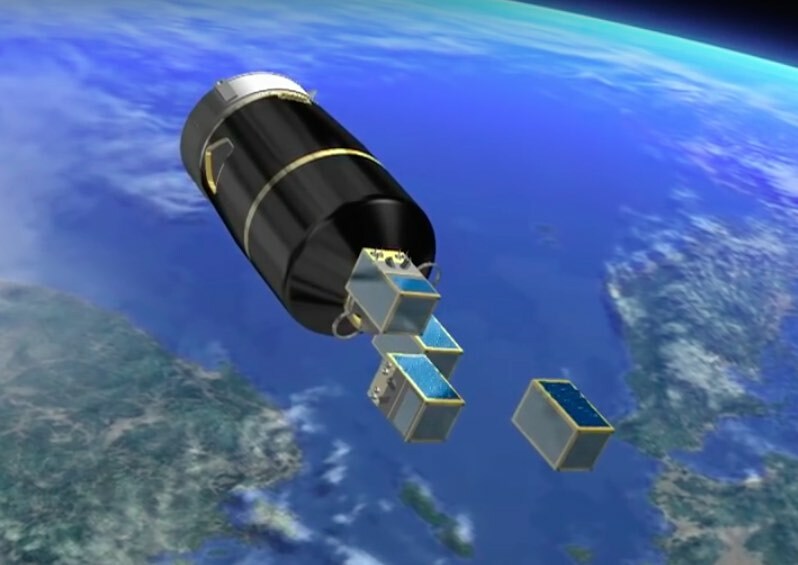 The SkySat satellites carry a Swedish-developed propulsion system fueled by environmentally-friendly “green” propellant. The thruster package burns an ammonium dinitramide (ADN) based liquid propellant, replacing the toxic hydrazine more commonly flown on satellites. ECAPS, the company which builds the SkySat propulsion module, says the high performance green propulsion system offers better performance than conventional hydrazine maneuvering jets, and the units are easier to transport and prepare for launch. Six more SkySats are scheduled for launch in early 2017 aboard an Orbital ATK Minotaur-C rocket from Vandenberg Air Force Base in California. 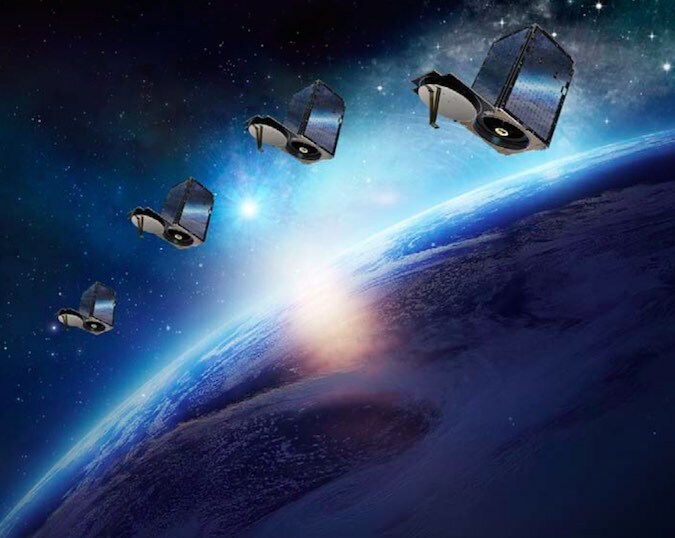 Terra Bella has ordered another eight satellites from Space Systems/Loral, but launch arrangements for those spacecraft have been been announced. Engineers at a ground station in Peru planned to take control of the 948-pound (430-kilogram) PeruSat 1 satellite soon after Thursday’s launch. After ensuring PeruSat 1’s solar panels extended and ensuring the spacecraft is healthy, the ground team will uplink commands for the satellite to boost its orbit to an altitude of around 432 miles (695 kilometers) to begin operational service. Built in 24 months by Airbus Defense and Space in Toulouse, France, the PeruSat 1 satellite is designed for a 10-year lifetime. The French government helped facilitate the agreement for Airbus to provide the spacecraft and ground systems, train engineers, and transfer technological know-how under contract to CONIDA, the Peruvian national space agency. Peruvian officials plan to apply PeruSat 1 observations in the defense and civilian sectors. It is Peru’s first major satellite program, and the most capable Earth-observing spacecraft owned by a Latin American country. “This is not only about injecting a satellite into orbit, but it is about operating this satellite to guarantee the development and the safety of our country,” said Mag Carlos Rodriguez Pajares, head of the Peruvian space agency. PeruSat 1’s silicon carbide optical imaging instrument has a top resolution of 2.3 feet, or 70 centimeters. Peruvian authorities want to use the satellite to monitor agricultural growth, support urban planning, help enforce Peru’s borders, respond to natural disasters, and combat drug trafficking. Speaking to guests at the French Guiana launch base Thursday, Pajares said PeruSat 1 will also detect illegal mining and logging damaging the delicate rainforest ecosystem in remote parts of the country. The next Vega launch is scheduled for Dec. 8 with Turkey’s Gokturk 1A reconnaissance satellite. Arianespace’s next mission is set for Oct. 4, when an Ariane 5 will lift off with the Sky Muster 2 and GSAT 18 communications satellites for Australia and India.